If the Pak-Indo Friendship Association has its way, Sikh pilgrims visiting Panja Sahib in Hasan Abdal in Pakistan would travel there in style in a bullet train, stay in five-star hotels and come back with purified water from the spring associated with Guru Nanak, the founder of Sikhism. Pak-Indo Friendship Association president Arif Chaudhary wants this and much more. Panja Sahib was declared a holy city by the Pakistan Government last year. Chaudhary met Chief Minister Parkash Singh Badal here today and invited him to Pakistan.Talking to The Tribune, Chaudhary claimed that the Nawaz Sharif Government was keen to promote ties with Punjab and that the Friendship Association would work in league with both the governments to promote investment in Hasan Abdal. “Panja Sahib, which was not easily accessible earlier, is now a 50- minute drive from Islamabad,” he said. The area had acquired further importance with Sikhs from various parts of Afghanistan settling there, he said. The lawyer said the forum was keen on Punjabi investment at Hasan Abdal, both by individual investors and the SGPC. He said the projects identified included a modern train service to Hasan Abdal, luxurious accommodation for pilgrims and bottling of the spring water associated with Guru Nanak. The Pakistan official said the forum would also try to sort out issues related to the welfare of Sikhs living at Panja Sahib. 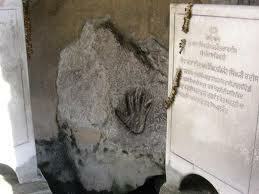 A rock in Panja Sahib is believed to have Guru Nanak's hand impression. Badal, while accepting Chaudhary's invitation, said he had always championed the cause for further ties with Pakistan through opening of the Hussainiwal and Fazilka borders. The Chief Minister hoped with the formation of a new government in Pakistan, the bilateral ties would further improve and new business and cultural exchange avenues would be worked out. SK Sandhu, Principal Secretary to the Chief Minister, said Chaudhary had promised to get something in writing from the Pakistan Government to carry the initiative forward. “Let’s see. Something may come out of it,” remarked Sandhu.